This article is just about to give you an orientation what camera to use for which application. It is written with the amateur in mind. To prevent you from reading a lot I will keep it simple. And I will only talk about cameras with larger sensors ( from Nikon 1 or Sony RX100 upwards ) up to full frame. Full frame is best because of dynamic range ( no blown out skies ) and available wide angle lenses. Lenses need to be less extreme to offer wide coverage. Smaller sensors usually have smaller dynamic range and lenses need to have extreme short focal length to give good coverage. Of course you can shoot landscape with small cameras too but it’s better to have the sensor as big as possible. Some people still using medium format or even large format cameras for landscapes. 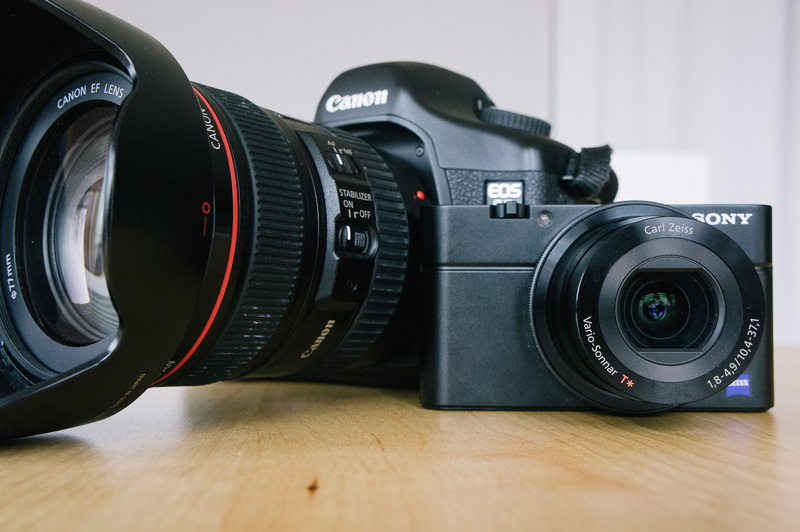 AF and frame rate are meaningless and because of that a Canon 6D or Nikon D600 is all you ever need. Transition of tones but most important subject to background separation is best with full frame sensors. It’s hard to achieve shallow depth of field with small sensors. You would need extremely fast lenses to compensate for the sensor. AF speed and frame rate is not important again but the number and layout of the cross sensor AF points is. Because there is only 1 cross type sensor on the Canon 6D I think this can cause troubles when shooting very fast lenses wide open. Focus and recompose doesn’t work and the non cross sensors are less reliable. All full frame DSLRs except maybe the Canon 6D because of the above mentioned issue. WRONG! I just got the 6D and it’s AF has very little in common with the 5d. It is far better. Even the outer focus points work in low light. With those subjects you want reach. Full frame might get you a better picture but that doesn’t help if you need to crop a lot. It’s best to crop in camera and high pixel density APS-C cameras are best for the task. Canon 7D has a clear advantage today as long as Nikon comes up with a high megapixel APS-C camera with fast AF and fast frame rate. The frame rate is extremely important. A Canon 7D takes one image in between every image you can take with a Nikon D800. That really increases the chance to get the perfect shot. Shooting in low light you got 2 options. Use a tripod. In that case high ISO quality is less important but it is still an advantage to have a low noise sensor. Good dynamic range is also a plus because of the mixed lighting. The sensor in the Sony RX100 and the Nikon 1 are too small for very good results. Why is the Sony RX100 not good enough when everybody raves about it’s low light qualities ( I did as well in this blog ). The RX100 does an outstanding job if you consider that it is just a compact digital camera. It is of course inferior to a Fuji X or a full frame camera. There is a 2 stops difference to a Fuji X100 and about 3 stops to a X-Pro 1 and the new full frame cameras. M43 cameras have vastly improved with the latest Sony sensor. All 16 MP versions should do rather good but still not as good as Fuji X and full frame. Here you need depth of field ( DOF ) to get most of your main subject in focus. With a full frame sensor and a long close up lens it is extremely tricky to get the whole subject in the focus pane. When shooting the wing of a butterfly you really need to take care to get it in focus. The Fuji X100 or the Leica X2 are amazing travel and street cameras but they are totally useless for close up photography. APS-C and M43 clearly work best. When you are a nature photographer you are very likely shooting birds, wildlife and close ups. In that case it is still best to have a good APS-C camera. For close up work a tilt and swivel screen might be a big advantage for low level work. Of course travel photography is the most complex topic here because you always need to compromise and you need to decide for each of your vacations separately. I assume that the typical reader of this article is not a travel photographer that makes a living out of his pictures. He/She is most likely a photo enthusiast that wants first of all spend a very nice vacations together with his/her family or friends. That usually also means that there is a need to compromise. What is more important? The photos I will bring home or having a good time? I know what I’m talking about. I put a very high importance to the images I took because photography always has been my favorite hobby. Though within the last couple of years I also enjoy to have less equipment especially in cities. Very small cameras like the Fuji X100 or the Sony NEX 5 with the pancake have become my most used gear. And of course there is a big difference in between a 4 day city trip to a 3 week RV vacation in Northern America. Most of the time it will be a mix of different needs: Full frame DSLR for landscape, APS-C DSLR for wildlife and a small camera for the city trips, restaurants and beach walks. If you go with a DSLR I recommend to try to keep the lenses as “light” as possible. That means f4 versions instead of f2.8. Today Canon and Nikon offer great travel zooms with constant f4 and image stabilization. If you want to travel really light but still using full frame get a “small” Nikon D600 or Canon 6D ( saves 200 grams over a 5D mk III ), a 24-105 plus a 70-200. You can also consider a 17-40 plus a 70-200. There is much more wide angle and only a small gap in between that isn’t covered. small APS-C DSLR like a Canon 650D + 18-200 universal zoom. Still a very capable setup that gives lot’s of coverage in a handy package. No need to change lenses is a nice thing too. Or even better a 15-85 lens that will offer better IQ but most important far more wide angle than the travel zoom. Or get a Fuji X plus zoom or better the 14, 18 and 35mm lenses. Very light but very capable. Sony NEX 6 plus power zoom (16-50) just about perfect for ultralight traveling. You can always add a 18-200 if you want to have a more versatile setup. Or of course a m43 camera with zooms or prime lenses depending on your preferences. Sony RX100. Yes I think that this camera is good enough to cover a vacation if traveling light is the most important factor. Of course it is inferior to the other solutions but it is so much better than a smartphone. A photo should record memories. Don’t let yours to be recorded by a smart phone. You might regret it one day. This entry was posted in Article and tagged APS-C, available light, Canon 5D III, Canon 650D, Canon 6D, close up, Fuji X, full frame, Leica X2, m43, nature, Nikon 1, Nikon D600, Nikon D800, portraiture, Sony NEX 6, Sony RX1, Sony RX100, travel photography, wildlife by admin. Bookmark the permalink.